The story begins with burning and pain... and ends with the results of a colonoscopy. LET'S GET THIS PART STRAIGHT, THOUGH: The Doctor's report is not a diagnosis. It is NOT the end of the road. It is NOT a stop sign or a stop light. It is NOT the final word. This IS a warning sign like -- SCHOOL ZONE AHEAD, SLOW DOWN, SPEED HUMP AHEAD, SHARP CURVE AHEAD, SLIPPERY WHEN WET. If you follow me on Instagram Twitter or Facebook, then you know I am a runner. I'm not the fastest runner. I'm not an elite runner. But I like to run. I like to compete. I run for good health, to meet new people, to be outside in nature... and hopefully to inspire someone I know to pursue their own good health. But, I was recently urged to get a colonoscopy. Colonoscopies aren't necessarily recommended before the age of 50 or 40. I'm 35. The recommendations change if there is a history of cancer in your family. 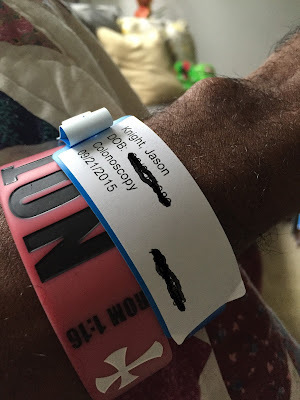 So why did I have a colonoscopy? It all started in August when I decided to ramp up my training for my next Half Marathon. The training schedule called for a huge bump in the weekly mileage -- close to 50 miles a week. Each week called for a long run of between 10 and 14 miles... sometimes both. This next part is a little bit personal and a little sensitive.. but maybe it'll help someone. Soon, I started to experience rectal burning and pain after those long runs. I hoped and expected it to stop after some rest. But it returned and lasted for 3 maybe 4 weeks. It was painful enough, that I skipped contacting a regular family doctor and went straight to a specialist... and gastroenterologist. In September, The doctor took one look and was concerned enough to order a colonoscopy. I knew that I had a race coming up,.. but I also know that timing is everything when dealing with health... So, I said "let's go" ASAP. The date: 9/21/20155, 6 days before Race 13.1 Charlotte. It's one of the reasons why I'll never forget this race. For those who don't know, you have to drink a bunch of stuff to clean out your bowels. I don't recommend anyone do this before a race. So, the doctor found one polyp during the colonoscopy and removed it. I thought and hoped that would be the end of the story and I'd move on with my life. One month Later, On October 23rd I got the test results on that plop. A pre-cancerous polyp. That's right -- the C word. I wasn't sure how to process the information. I'm still processing it. The doctor said., "You're a lucky man. 5 years later and we'd be talking about full blown colon cancer." Then he told me the story of a current patient who is also 35 years old. She is fighting colon cancer which is spreading to other organs. She has two young children and she is fighting. I pray for her health. Then I ask him about my original problem: The discomfort that caused me to call him originally. He responds with, "It doesn't matter, we found the polyp. You dodged cancer. I'll see you again in Five years." I'm sitting there laughing, smiling, confused... but thanking God. Specifically, I'm thanking God for the pain, the burning, the running, the doctor's insistence that I get a Colonoscopy... and even the 35 year old patient who is battling cancer. Without one of those factors, my story would be different. To God be the glory. I don't want to over-dramatize this at all. I don't have to do anything until my next colonoscopy in five years. No pills, no special diet (although, I'll be making some adjustments.) But, if anything-- this is why I have a blog. To share and to help someone else. Please, listen to your body. If there is something wrong... go see a doctor. Guys, listen to your wives. If you have a family history of colon cancer, get your colon checked early. So, I'll be supporting several Colon Cancer Awareness campaigns in the future.. including the Check Your Colon Campaign... I'm sure to find a 5k race or something that I can also focus my energy on. As for that 13.1 Charlotte Race-- I was dehydrated (possibly because of the colonoscopy) and started to cramp up after mile 9. I finished. But I finished with cramps in both Quads and Calves.... It was like trying to run on peg legs or stilts.... but I finished.